I have always had a fascination with bridge construction. How can one not look at them as art? I also have a fear of some bridges, such as those that carry you over a deep, deep chasm. But let’s concentrate on the art factor. Bridges have been around since ancient times, and up until the nineteenth century were constructed primary of stone (in the West) and wood (in the East). Although cast iron was developed in China in the 6th century ce, it was not explored in the West in Europe until the fourteenth century. It was originally used for cannons and shot. Henry VIII initiated the use of English forges for producing cannons out of iron. England soon became a major producer of iron. 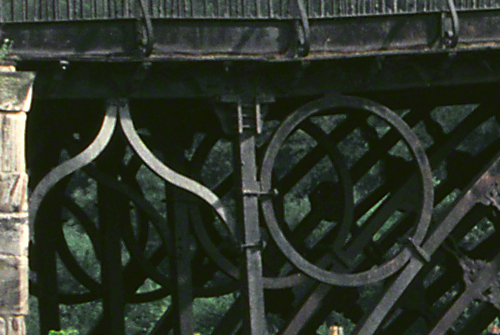 Iron is strong under compression (in arches that bear weight), but not under tension (such as single beams under a railroad bridge). Armament was one of the main uses of cast iron after the mid-seventeenth century. Abraham Darby III’s (1750–1789) grandfather invented coke smelting, which greatly improved the production of brass and iron in Britain. His son (Abraham II, died 1763) managed the Coalbrookdale Company ironworks, and established several other foundries, while managing regional coal mines. 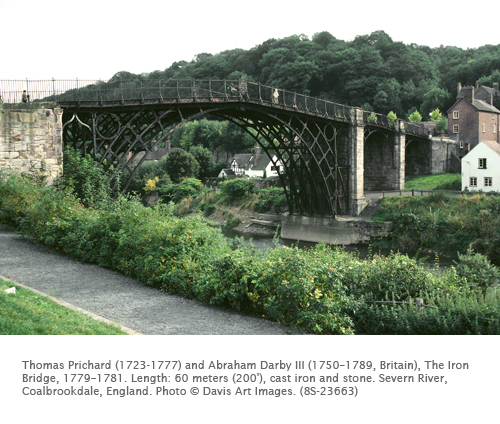 In 1768 Abraham Darby III took over Coalbrookdale Company ironworks and significantly expanded its production as well as the type of products it offered. Darby patented a method of making thin, cast iron pots in Coalbrookdale in 1777. His furnaces there became the dominant supplier of these wares. From 1779 to 1781 he built the first cast iron structure for a bridge in the world. The properties of the material (stronger in compression) and the state of engineering at the time determined the form that the bridge assumed. The five semi-circular arches were definitely influenced by the stone vaulting of Gothic cathedrals, and afforded a light, airy feeling to which twelfth century builders could only aspire. Cast iron quickly became acquainted with light-weight, skeletal structures for buildings. This led to the design and building of the magnificent train stations in Paris, and eventually the Eiffel Tower. The further refinement of cast iron led to the development of steel, which was harder and had a better tensile strength. It became the basis of skyscraper building. Activity: Design a bridge. Using pencil, colored pencil, markers, crayons, or watercolor, design a bridge that spans a small river. Make sure to indicate each shore on which the bridge rests, or indicate any support in the middle of the bridge. Rely on the arch as a basic form, and harmonize other shapes with the arch.